Boxing has found the Answer to the Mega Bout dream match between Manny Pacquiao and Floyd Mayweather Jr. on the heels of Top Rank’s official announcement yesterday that Pacquiao is set to fight Timothy Bradley on April 12. Arum appears believable in the recent Michael Wood interview. Watching him talk, the people may be apt to believe that he is serious giving away all his earnings in the proposed “charity fight” between Mayweather and Pacquiao. But I saw through his seemingly sober and meek posture that the opposite was what he actually meant in the same interview. 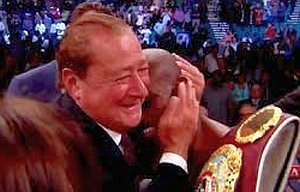 Arum loves his bucks too much to let go of them, hence he cherishes in-house fights dearly like the “Pacquiao-Bradley II.” Arum knew all along that the Mega Bout won’t ever happen as long as he is the cash cow’s promoter. That, my friend, is exactly the score. Get it. Wily indeed is Mr. Arum, a master of double talk and manipulation. Pacquiao needs to stop saying “it depends on my promoter.” He must be very careful at this time to sign any paper coming from Arum and Michael Koncz. Pacquiao should let lawyer Frank Gacal study and peruse all the documents first before deciding on anything that concerns his boxing career lest he might be shortchanged into extending his contract with Top Rank on account of stupidity as the only reason I know why he has to remain with Arum. I don’t know about you, but I’m not interested in the “Pacquiao-Bradley” and “Mayweather-Khan,” nor will I pay to watch both bouts for they are anathema to a truly thriving, healthy sport. Teach them lessons and give other excellent boxers the chance to shine. Have the right focus to grow bones.